Every now and then, I get criticized for operating a portable sawmill service as just another crazy lumberjack whacking down trees, clearing forests, and destroying habitat. I’m sure other sawmill operators have had similar experiences, so let me set the record straight … again (I wrote about this a couple of years ago but it bears repeating). First of all, I consider myself to be an environmentalist. The photovoltaic panels on the roof of my passive solar house are kicking out 4.3 kW as I write this. I have been a vegetarian for over five years (yet still have the strength to pick up a chain saw), and my daily driver is a tiny Chevy Aveo. I also have a degree in Forestry, am a certified Master Logger, president of the Missouri chapter of the Walnut Council, and manage the 2006 Missouri Tree Farm of the Year. Although I do plant somewhere around 500 trees per year, most regeneration comes from existing trees, under a sustainable, uneven age management plan. Hopefully this gives an idea of my commitment to environmental stewardship. 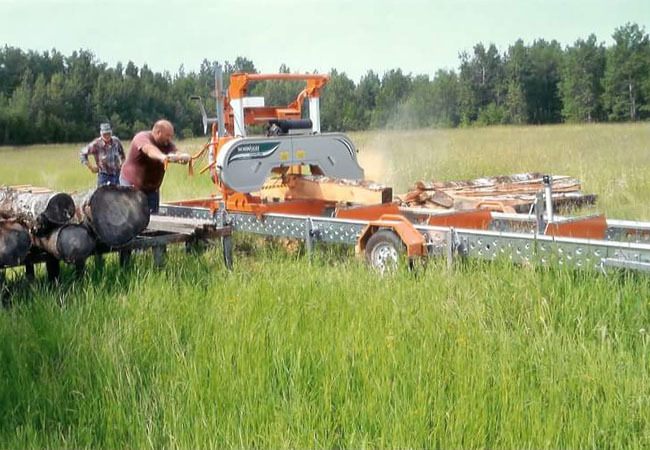 Running a portable sawmill fits in perfectly with this commitment. First of all, it allows me to get the maximum value out of every tree. Rather than having a logging crew come in, I can select individual trees that are either dying, or need to be thinned to allow better trees to grow with more vigor. I use small, low-impact equipment to pull logs out of the woods, only when the ground is hard to avoid damage. Most people would walk right past an area where I had worked and not even notice any disturbance. Large commercial loggers, with hundreds of thousands of dollars invested in equipment, simply cannot afford to take the time to do this. The portable band saw mill makes it possible to recycle these logs into lumber, and gives me the satisfaction of knowing every board I produce is one less that will come from a commercial lumber mill that has only profit as a motive. Lately, my logging equipment has been sitting idle most of the time. Tree services supply me with a steady stream of urban logs, and salvaging trees uprooted by the all-too-frequent storms (including tornados) that rumble across southwest Missouri keeps me pretty busy. Most of this salvaged wood would otherwise be chipped for mulch, cut up for firewood or buried in a landfill. The portable band saw mill makes it possible to recycle these logs into lumber, and gives me the satisfaction of knowing every board I produce is one less that will come from a commercial lumber mill that has only profit as a motive. 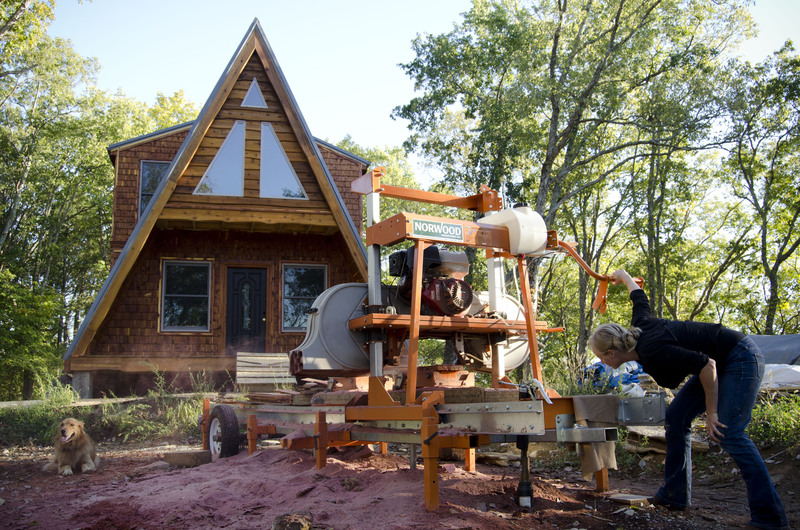 Operating a band saw mill is, in many ways, similar to organic gardening. First, it is local – Woodworkers especially like having an option to use local species that never make it to lumberyards, such as honey locust, sycamore, Osage orange or elm. Not every board is perfectly clear, just as not every tomato in an organic garden is free of blemishes. As a fellow sawyer put it, “you take what the tree gives you.” What the local trees give is character, and woodworkers love it. The sawmill lets me bring out that character, and I often have to stop and wipe the sawdust off a board so I can marvel at the beauty of the wood that would have gone to waste without a sawmill operator like me to save it. Band saws get the most out of every log. The thin kerf of the band (only 1/8” thick) produces about 1/3 the sawdust of a commercial mill, which means more boards out of every log. Just as organic gardeners strive to get the most possible out of a limited piece of land, band saws get the most out of every log. The thin kerf of the band (only 1/8” thick) produces about 1/3 the sawdust of a commercial mill, which means more boards out of every log. Nothing goes to waste at my sawmill. The slabs heat our home and several others in the winter. Sawdust goes to a composting area. It is particularly satisfying to cut lumber that will be used for chicken houses, bee hives, raised bed frames—and produce compost— for local organic farmers to use to grow produce which they sell at the local farmer’s market. Small band saw mills conserve fuel resources, as well. The thin sawblade requires about 1/10th the power— and less fuel— than commercial mills. Even after a full day of running my mill, I have yet to empty the three-gallon gas tank. Let’s talk transport! – Using local logs to be sold locally means trucking in logs and transporting lumber is kept to a minimum. In many cases, when working on a customer’s site, logs and lumber never even leave the property! Some people operate small sawmills as a hobby. Woodworkers use them to provide unique local wood for their projects. Those of us who run a sawmill for income have the good fortune to combine business with pleasure. 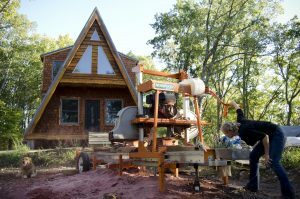 So, instead of criticizing small sawmill operators, why not find one and use a locally produced material instead of buying from a big lumber yard?